BSA represents landholder, community groups and individuals who are worried about the rapid and unrestrained development of the coal seam gas industry across Queensland. 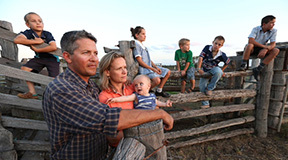 We are committed to working with industry and government in the hope we can achieve a CSG industry that preserves our groundwater resources, our lifestyle, and our ability to produce food and fibre for future generations. Science must inform development, impacts must be mitigated, and activities should not proceed where the risk it too high. We urge our decision makers not to be blinded by the lust for royalties and jobs. The industry cannot proceed ‘at any cost’. Approached by a CSG company? Use this tool to calculate potential impacts of gasfield development, such as the number of CSG wells that could potentially end up on your land. BSA is proposing to develop a concept called CSG Watch. We liken it to Neighbourhood Watch whereby it is a community network coming together to keep a watchful eye on their own backyard for CSG impacts.